It has been too long since I posted something. I was just too busy taking care of sick children and going on a holiday. But yesterday I finally found some time to paint something again. On Flickr, in the *Watercolourist, Painting with light* group there was a nice challenge photo. 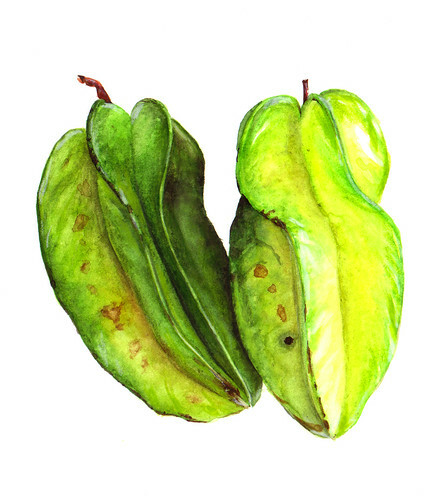 Two carambolas (or starfruit). The colours were so bright. Green colours, almost toxic, you don't always see in nature. So I thought this would be a lot of fun to explore the greens. I soon found that the best, most explosive green I could get was by mixing Winsor&Newton's Lemon Yellow and Hookers Green. For the shades I used Indigo, Caput Mortuum with the green. The browns were Raw Umber and some Burnt Sienna. Some small details were added at the end using a bit of Sepia. Gosh, this was really fun!